I have a nagging resolution that I have made for the past few years and never really did anything about: updating my make-up routine. I’m slightly embarrassed to say my make-up bag contents are nearly identical today (at 34 years old) to what I was using in college. Those products that I’ve probably been using for the better part of a decade are about as simple as they get, and I keep telling myself that I’m going give my routine a revamp to feel more age-appropriate. 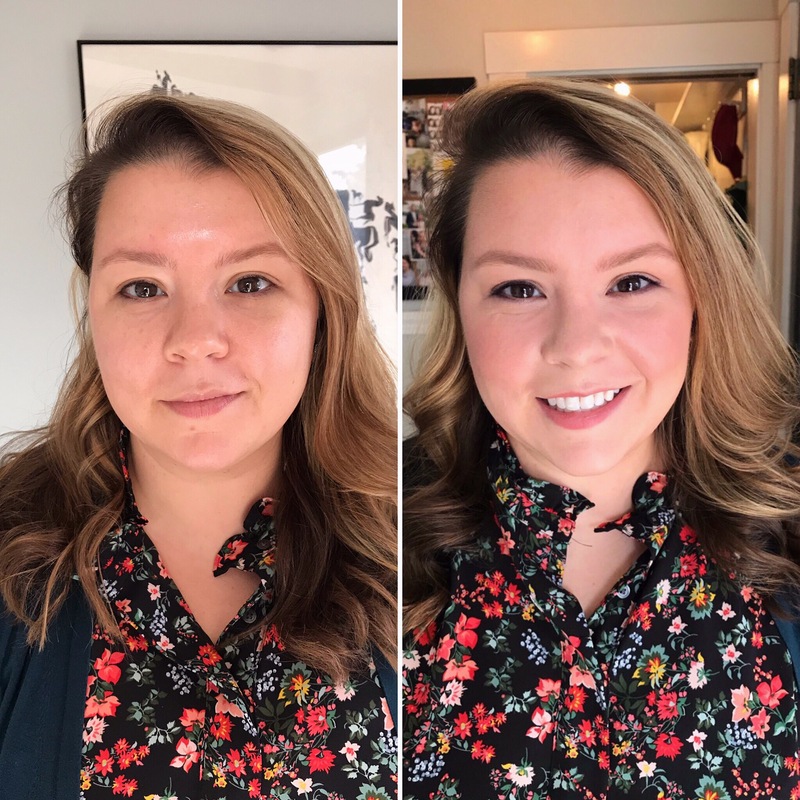 My friend Amanda is a talented make-up artist and esthetician, and she offered to give me a little make-up therapy session to finally tackle this resolution of finding a refreshed make-up routine. I learned SO much from our lesson that I had to share her wealth of tricks, tips and favorite products here – it was too good not to share! To start, I laid out everything in my current make-up bag so she could see what I was using, and I was happy to hear that I wasn’t too far off from what she was planning on showing me. The biggest things we talked about was that I was using a lot of powder-based products (blush, bronzer, eye shadow), and she suggested that for winter months when skin was dryer to try some cream-based alternatives. Once we got deeper into the lesson we talked about the difference between a few of my drug-store buys vs. investing in higher quality products. Amanda had some good advice on great drug-store buys (Cover Girl Lash Blast Volume, write that down!) and where you might want to invest (I was easily convinced to add new eyebrow pencils to my shopping cart after noticing the difference in a higher-quality pigment). After we dug through my current make-up bag and routine, we got started on my make-up lesson, and I took a gazillion notes like the nerd that I am – here is what I learned: Prep Skin and Build Your Base. I’m admittedly pretty low-key about how I take care of my skin, and Amanda gave me some tips for prepping the skin before make-up application starts. She used a great analogy about painters using a fresh, clean canvas — start by taking good care of your skin. Washing your face, using a great exfoliator, moisturizing and using eye cream all help prep the ‘canvas’ for your make-up routine. I had a lot of questions about eye cream because I don’t use one right now. Amanda’s advice was to start using eye cream at my age (mid-thirties) because the skin around your eyes is very delicate – hydrating that skin is key for a youthful, fresh look. Sunday Riley Auto Correct Brightening Eye Cream was her recommendation for me to start with. We also talked about prepping the lips – my lips definitely suffer with cold winter weather and she recommended exfoliating with French Girl Rose Lip Polish and then hydrating with Image Ormedic Sheer Pink Lip Enhancement (I can’t tell you how well this worked, I noticed a difference in just the time we were talking). After that we used a French Girl Organics Toner – which I also had Amanda explain to me is important to restore the natural ph of your skin after cleansing. We used a matte primer to help fill in the appearance of large pores and helps with shine-control – which was a game changer for my less-than-perfect skin. Then we talked about liquid foundations! I had a million questions about foundation, I don’t use one right now and I felt like this was one of the grown-up items I needed to add to my tool-kit. Amanda recommended Laura Mercier Flawless Lumiere Radiance Perfecting Foundation on me because it had all-day lasting power, she recognized that busy working women and moms generally don’t have time for a major make-up touch up throughout the day and this one was long-lasting. I was hesitant about foundation looking too heavy on my skin so taught me a trick: mix it with your moisturizer to sheer it out a bit. 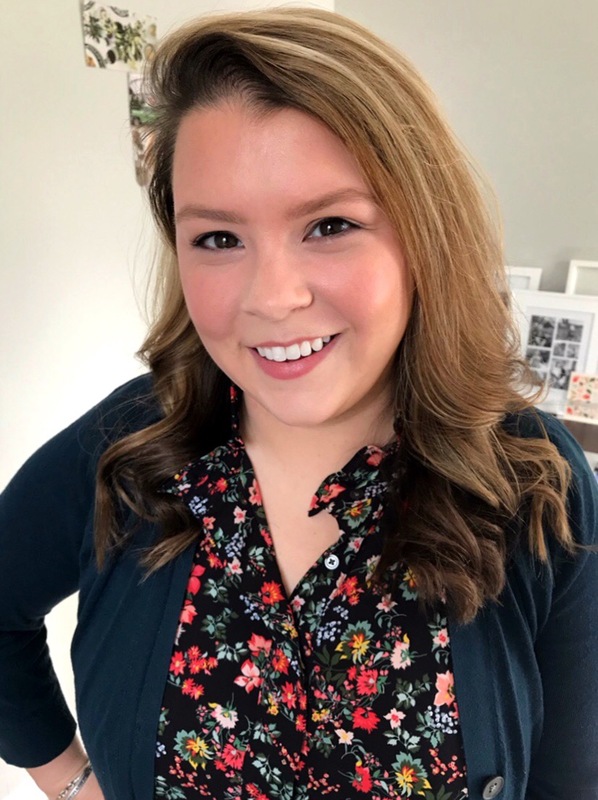 We also used the Trish McEvoy Instant Eyelift to brighten up my under-eyes – it made a huge impact for my tired-looking toddler-mom dark eye circles; Amanda called this product a mom-essential! Blush and Bronzer. Of all the beauty products I feel like I can’t live without, my blush and bronzer are top of the list. I currently use powder varieties for both, and Amanda had me try out cream-based blush and bronzer products for the winter when skin tends to be dried out. She picked a bronzer and illuminator combo for our lesson and showed me how to apply just to the spots that would look sun-kissed, and then go back in the illuminator to highlight across the top of the cheekbone where light naturally hits – it was a bit more purposeful than my all-over approach I was currently using. We also added a cream blush stick — Westman Atelier Baby Cheeks Blush — to the apples of my cheeks after the bronzer, and I was excited to hear the product she recommended could do double-duty as a lip-color as well – keeps things simple! Eyes and Eyebrows. On a daily basis, I don’t usually wear eye shadow or do anything with my eyebrows – just a little eyeliner and mascara is all I have in my current routine. Amanda suggested that I find a neutral champagne or taupe colored eye shadow for daily-use in order to add a bit of depth but not much complexity to my routine. We used the Eyes To Mesmerize Cream Eye Shadow, and she also recommended the Clinique Chubby Sticks for another cream eye shadow alternative. For my eyebrows we used the Anastasia Beverly Hills Brow Wiz in Taupe, and this was one product I noticed a big difference in from my drug-store beauty buys. The Brow Wiz didn’t have the heavy, waxy feeling my current brow-pencil has – the fine tip made it way easier to create light, feathery strokes that looked very natural. Amanda recommended finding a color that is closest to your roots for the most natural-look. I’ve used the exact same eyeliner brand since my freshman year of college, and it’s one thing I felt very loyal to in my make-up bag. Amanda was there to get my out of my comfort zone though, so she suggested in the winter when my skin is a bit fairer to swap out the black eye-liner I love for a warmer tone like a deep brown or plum gel eye-liner – it looks a bit softer and less high-contrast. As for my eye lashes, Amanda offered two tips: 1) get yourself an eye-lash curler, it instantly makes your eyes look brighter and more youthful, and 2) grab Cover Girl’s Lash Blast Volume mascara at the drug store. It is her favorite drug store beauty item because the fine wand bristles stay clean to create long, clump-free, lashes. I’m running to the store to buy it! Finishing Touches. We used the same cream blush stick for a little color on my lips (this NARS stick was another double-duty recommendation), and then finished the look off with a translucent powder to set the make-up and reduce shine. As I was finishing scribbling notes and taking our “after” pictures, I asked Amanda how she stores her make-up at home. We’re all Marie Kondo’ing our live these days and digging through my make-up bag doesn’t exactly spark joy. Amanda recommended clear trays or drawers so you can see everything out in the open when you’re getting ready, and organizing the products chronologically by steps to streamline your morning routine – I loved that idea! I left our quick session with four pages of notes and tons of new tricks, as well as a shopping list for a few new items I’m going to upgrade in my make-up bag! 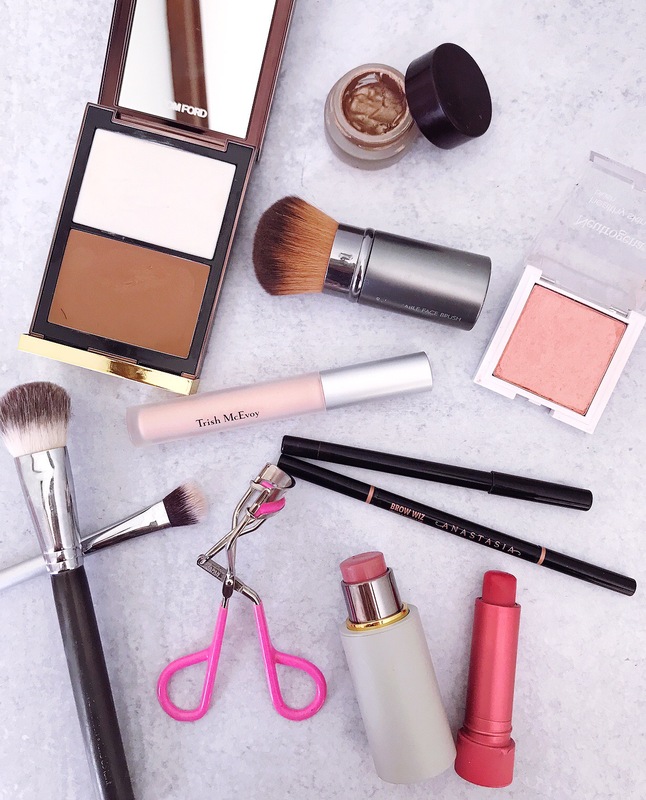 The cream blush, the lip treatment, and the eyebrow pencil and drug-store mascara were my favorites, and I just might be making a trip to Sephora this weekend for some new tools to add to my kit. I wish I hadn’t put this off as long as I did, and I can’t wait to do it again for a summer-look when the weather starts to get warmer! One-Pan Italian Sausage and Roasted Vegetables. Dark Chocolate and Salted Caramel Milk and Cookies. 2 Responses to "My Beauty Routine Make Over." Love seeing some beauty content up in here! Gorgeous, Kate! Love these kinds of posts!